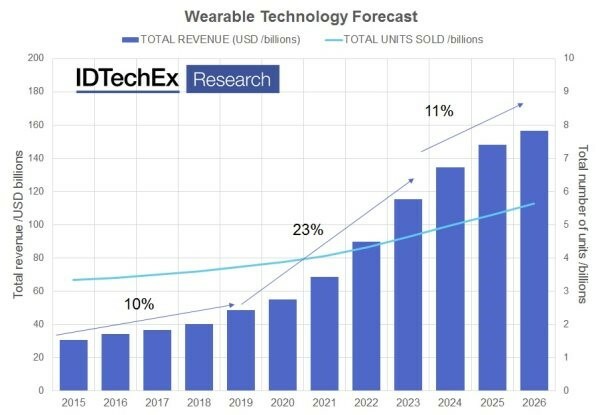 With hype around some of the core wearable technology sectors beginning to wane, IDTechEx have released their latest analysis of this diverse and growing industry in their brand new report Wearable Technology 2016-2026. The report finds the market to be worth over $30bn in 2016, with over $11bn of that coming from newly popular products including smartwatches and fitness trackers. However, despite the total market growing to over $150bn by 2026, IDTechEx forecast shake-ups in several prominent sectors, with commoditisation hitting hard, and product form factors changing rapidly. By James Hayward, Technology Analyst, IDTechEx. The IDTechEx report covers these trends in granular detail, including 39 separate forecast lines by product type and 60 formal company profiles and interviews compiled from primary research by IDTechEx’s expert analysts. The report also covers all of the industry megatrends that are driving innovation, demand and development, as well as describing application sectors including fitness & wellness, elite sportswear, healthcare & medical, infotainment, commercial, industrial, military, and others. For each, general sector-wide themes are described, but also detailed case studies are used to explain value propositions, end user needs and unmet problems that are driving the market forward. Global wearable technology forecast summary, including 39 forecast lines covering all prominent products today (e.g. smartwatches, fitness trackers, smart eyewear, smart clothing, medical devices and more), but also to many incumbent products (e.g. headphones, hearing aids, basic electronic watches and more). Fuelled by a frenzy of hype, funding and global interest, wearable technology was catapulted to the top of the agenda for companies spanning the entire value chain and world. This investment manifested in hundreds of new products and extensive tailored R&D investigating relevant technology areas. However, the fickle nature of hype is beginning to show, and many companies are now progressing beyond discussing wearables to focus on the detailed and varied sub-sectors. 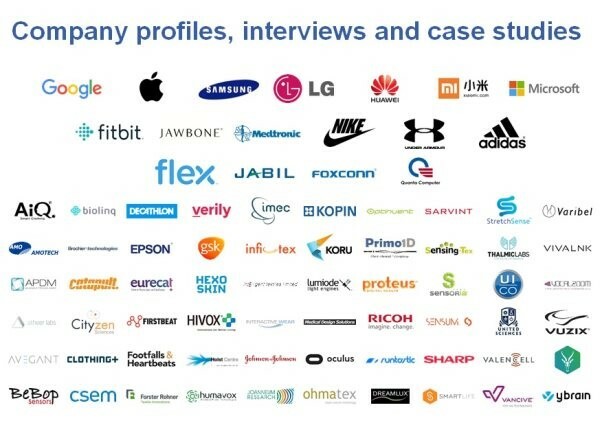 Within this report, we include sections on each key of these key product areas, including fitness trackers, smartwatches, smart clothing, smart eyewear (including AR and VR), smart skin patches, headphones and more. For each, the key trends are discussed, the key players characterised, and qualified market forecasts provided. IDTechEx’s expert analyst team has been covering this topic for over three years, including device level studies, but also looking to the component level at displays, sensors, batteries & power solutions, MCUs, e-textiles and haptics. This understanding of the entire value chain is used to qualify the market forecasts, and particularly when looking at the future of personal communication devices. In a unique aspect of this report, IDTechEx outlines a long term case for standalone wearable communication devices as a future evolution of the smartphone. Today, most smartwatches and many fitness trackers still rely, at least partially, on a connection to a smartphone hub. The ubiquity of the smartphone as a central platform has been a key enabler for growth in wearables so far, but all of the largest manufacturers now look to a future, where the hub itself may become wearable. In the report, the authors describes the growth central, personal hub providing connectivity to peripheral devices, whether they be displays, sensor platforms or otherwise. With many smartwatches already beginning to move in this direction, we extend this case further providing a 10 year forecast for growth of devices of this type. This is the most thorough and comprehensive report covering the entire wearable technology ecosystem. It provides detailed description of all of the hardware challenges and opportunities across the varied device types, and draws from IDTechEx’s case study database of around 1,000 companies in the wearable technology value chain. The report lists around 500 companies actively making products (both hardware and software) to support this report. Some of the companies with profiles, case studies and/or interviews in the report. Is it time to move on from wearables?